Leonardo da Vinci–The Musician and Scientist: How Leonardo da Vinci’s musical knowledge and skills informed, and was informed by, his scientific inventions and knowledge of the natural world. It is not well known that Leonardo da Vinci was a musician. 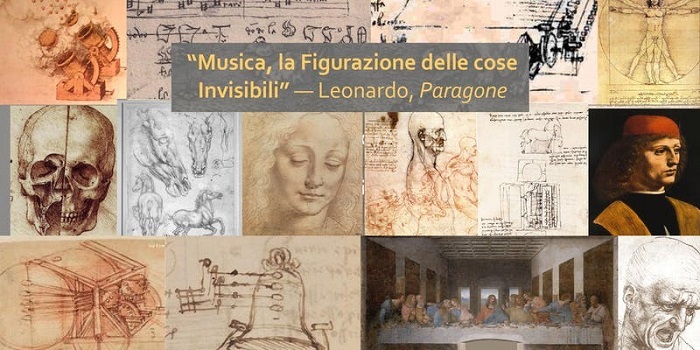 The brochure for the 2014 exhibit of Leonardo’s design of musical instruments at the Pinacoteca Ambrosiana in Milan, Italy notes: “This catalogue introduces us to Leonardo the musician, a man with a talent for singing and poetry recitation, capable of accompanying himself on the lyre and presenting fascinating improvisational performances, always in search of new acoustic effects and aesthetics”. The Foundation for the Revival of Classical Culture is happy to bring this two-part thought-provoking presentation on Leonardo da Vinci as a musician and scientist to St. John’s in the Village, 218 W. 11th St., NYC. Dr. Michael Eisenberg, curator of a 2014 exhibit at the Pinacoteca Ambrosiana in Milan on da Vinci’s designs of musical instruments, and the Codex Atlanticus, will lecture, and perform on harpsichord, organ and Renaissance harp. He will be joined by Dongmyung Ahn on historical strings, Alex Yu on historical wind instruments, Carlos Valte on historical plucked instruments, and Patricia Sonego, voice. To provide an overview of Leonardo’s early musical journey, his musical instrument design, and his use of other scientific domains to inform his acoustical experiments as grounded in the musical, intellectual, and scientific inquiry of the Sforza, Medici, and Este courts. National Endowment for the Humanities fellow for studies on Leonardo da Vinci’s integration of art and science, Dr. Michael Eisenberg specializes in early modern performance practice and its relationship to visual culture. In 2014 he was invited to curate the Pinacoteca Ambrosiana di Milano’s exhibition of Leonardo da Vinci’s images on music and acoustics with Pietro Marani. For seven years, he performed on the roster of the Carnegie Hall Neighborhood Concert Series interpreting music of the Italian Renaissance and Baroque. Dr. Eisenberg has taught and held research fellowships at Columbia, Harvard, UCLA, the University of London School of Advanced Studies, the Italian Fulbright Commission, the Delmas Foundation, and the Getty Research Institute. As a member of the Metropolitan Opera Guild roster, he was selected as the only conductor to perform for the Placido Domingo Met Gala celebration. Michael has performed throughout Europe, the Americas, Asia, and the Middle East, and for the National Public Radio, the BBC, CBC and HBO. His recording credits include two-time finalist prizes with recording contracts in the EMA/Dorian international recording competition. Michael is the founding artistic director of chamber ensembles Le Nuove Musicheand Ensemble for the Seicento and holds masters degrees in harpsichord and piano from the Mannes College of Music as a Sylvia Marlowe Fellow, and a Ph.D. from the City University of New York. Dr.Eisenberg is a 2019 Gilder Lehrman fellow at Princeton University.